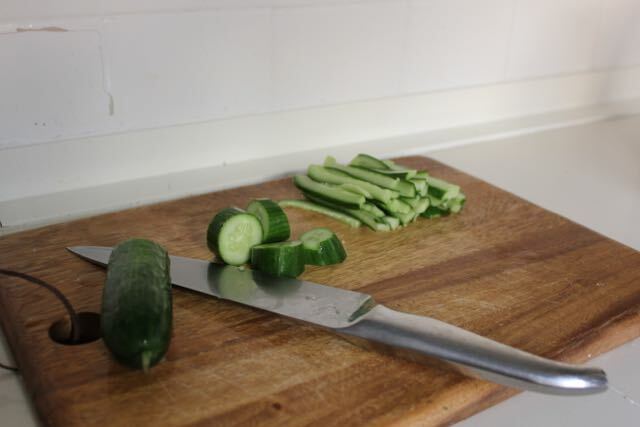 Cucumber used to be the one vegetable I didn’t enjoy. Watery, crunchy, subtle taste which didn’t make sense to me. However, I have come to enjoy it as a support act for other flavours. Saturday night at home called for a special meal, here is my suggestion for two ways to enjoy cucumber. First – Gin and tonic! We usually enjoy Hendriks but we recently discovered Four Pillars which is an Australian flavoured gin which uses botanicals such as Tasmanian pepperberry, lemon myrtle as well as spices such as cinnamon, star anise, cardamom and coriander seeds as well as lavendar and angelic root with the traditional juniper berries. It is equally delicious with quality tonic water and cucumber (for me) and lime (for Stu). I was in Marrickville and I couldn’t walk past the Peking duck shop without buying one for dinner. 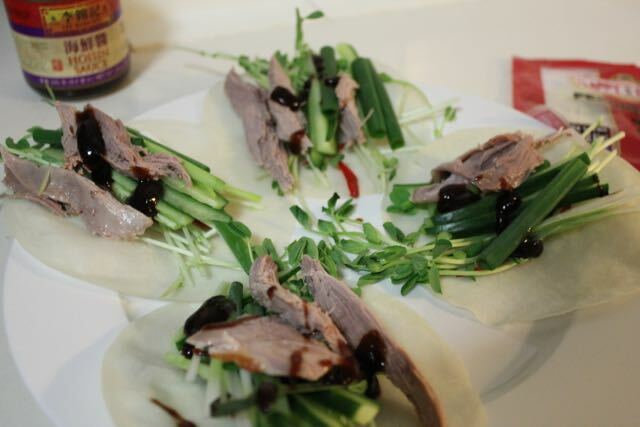 I knew I had hoisin and wraps at home which made for a super fast and super delicious dinner. Slice your veggies, spread your sauce and dollop your duck on top. We may have eaten them on the couch, and Stuart definitely had seconds. Duck is on the pricey side so I will be serving the left over meat with Asian greens and rice for another dinner, and roasting the bones to make stock for soup which I will post about later. I hope you enjoy will enjoy cucumber as much as I do.